What was it like growing up in a small town in the deep South in the 60’s & 70’s? Well, this is what it was like for me. A special moment … frozen in time. Father’s Day 2009. Elizabeth’s first fishing trip, observation dock. All of us have a moment in our lives. A perfect moment, a moment we remember with perfect clarity, a moment we can remember as if it just happened. If we are lucky, we realize the significance of the moment while we are living it. Just such a moment happened to me on Father’s Day 2009. However, as I always tell others, “It is the bad days that let us really appreciate just how good, the good days are.” My perfect moment was staged by an experience, which began months before; an experience that let me appreciate my perfect day to the fullest. In 2009, I was working two jobs. I would come home from my day job for an hour, and then leave for my night job. After my night job, I would drive to my day job. I would catch a couple of hours of sleep in the parking lot and then start work. People who talk about the hubris youth should witness the presumption of a middle-aged man that does not realize he is middle-aged. After a while, my immune system began to weaken, and I came down with strep throat. I can still remember the conversation with the doctor in our plant medical department. “Are you allergic to anything?” asked the doctor. “Not that I know of” I quipped back. The doctor gave me a prescription for an anti-biotic I had never heard of before. The next day I was feeling worse, but I thought it was the infection. I came back in from lunch earlier than normal. My work area is just outside the cafeteria. As lunch was ending, I collapsed on the floor and could not breathe. One of our nurses and several of our first responders were coming out of the cafeteria as I collapsed. Everyone was on the scene when I needed them. 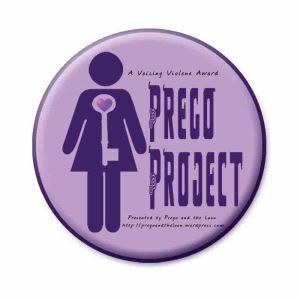 I thought I was having problems from the infection when I heard one of my rescuers say, “get the paddles and a tracheotomy tube ready.” They thought I was having a heart attack. At the hospital, the doctor told me I had an allergic response to the anti-biotic and went into anaphylactic shock. He said I was lucky and not to take that anti-biotic again. I wasn’t planning too. When I finally got back to work, everyone in the medical department came out to see me, and tell me they didn’t think I was going to make it to the hospital. My rescuers restored my breathing in thirty minutes, but I was exhausted for about five days. I was surprised how much energy it takes to breathe when your throat closes shut. I do not think I would have made it, if they had not restored my breathing when they did. When I saw my personal physician he told me that I was not 27 anymore I was 47, and if I didn’t give up the second job I would be seeing a lot more of him. I have always been proud of my first daughter, Alexandra. I just did not realize how strong she really was, before I collapsed. At twelve inches long, 16 ounces, she lasted for ninety-three minutes without being able to get oxygen into her blood. My God, thirty minutes almost killed me; me a grown man, and she went ninety-three minutes without being able to get a good breath. I had no idea someone so tiny could be so strong. I am so very proud of both my girls. Father’s Day was just a couple months after my collapse at work. Elizabeth, my youngest daughter, was four years old; I wanted to do something special with her. I knew just what I would do. I would take Elizabeth on her first fishing trip. I knew just the place too. East of Columbus is a park that is a 19th century working farm with a picnic area, playground, and a fishing pond. I remember my first fishing trip; I was about the same age. My brother and I, he is a couple years younger than me, drove my dad nuts. Jeff caught a bluegill and I caught a catfish. Best fishing trip I ever had. Elizabeth was excited about the trip. As we walked down to the pond, we passed a man with his children coming back up from the pond. We were loaded down with fishing gear, but I decided not to be sarcastic. “Ya”, I replied. “Go past the first dock to the second one. They are lined up waiting on you.” He said. When we got to the second dock, he was right. 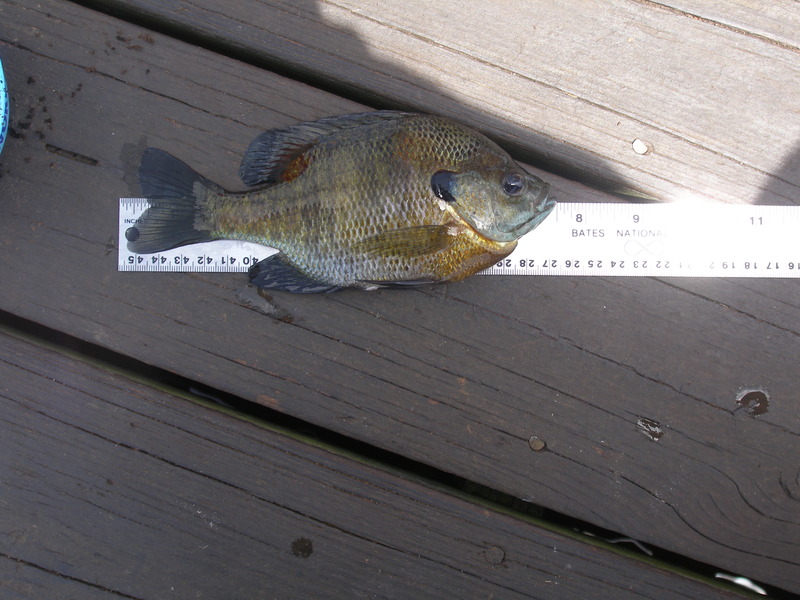 You could see to the bottom of the pond, and the bluegills were in a semi-circle around the end of the dock. I had never seen that before. It looked like they were seated waiting on a concert. 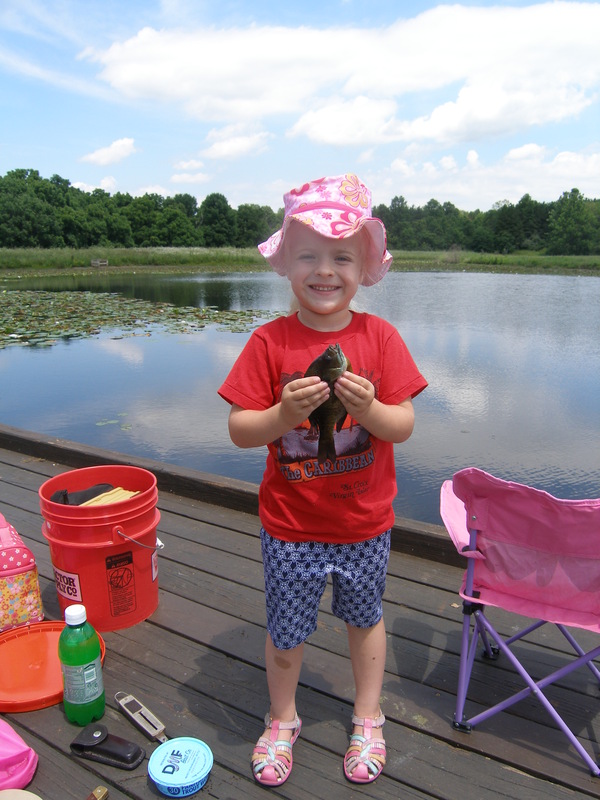 Elizabeth caught 15 bluegills that day. The expression on her face for the first catch was perfect, a look of pure joy and contented happiness. The kind of expression a father never forgets. The kind of expression that makes you feel warm inside. It was one of those moments when you realize just how lucky you are to be a dad. 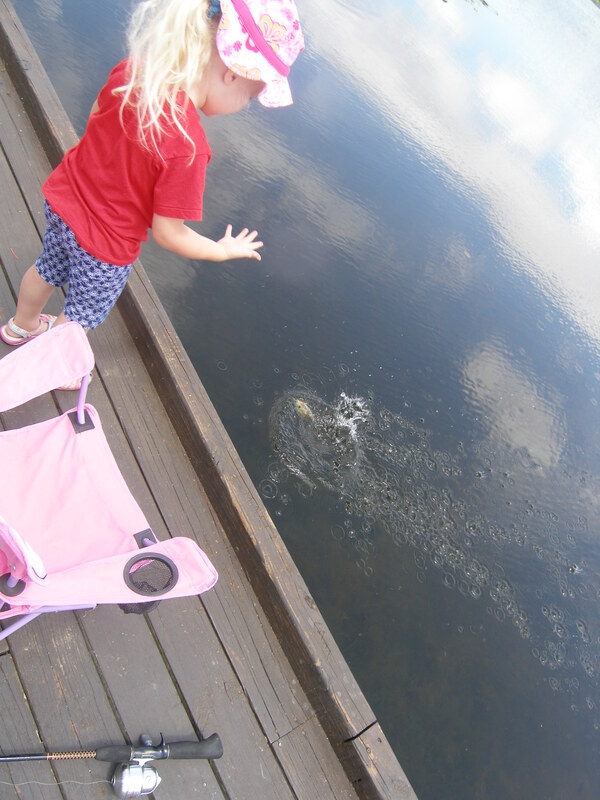 Elizabeth’s first fish, Father’s Day 2009. Knowing how close I came to never being able to share this experience with my daughter, made each moment, each catch, just like the first. I taught Elizabeth how to cast, and she cast her line right where I told her, each time. I was not such a quick learner, but I do enjoy fishing. Sometimes I even put bait on my hook. Elizabeth releasing her first fish. Eventually, I got tired of fishing and asked Elizabeth if she was hungry. So, we did. After Elizabeth’s 18th catch and release, she finally wanted to eat, and play at the playground. As we were walking back up to the playground, we stopped at the observation dock and asked a stranger to take our photograph. That photograph is the most valuable of all my photographs; I keep a print of it in my home office. Even today, three years later, I still find myself pausing from time to time to look at that photograph, and remember my perfect day. The day after our fishing trip, I took a print of that photograph into work, to the medical department, to show my heroes. We fish at a pond near our house on weekends now. 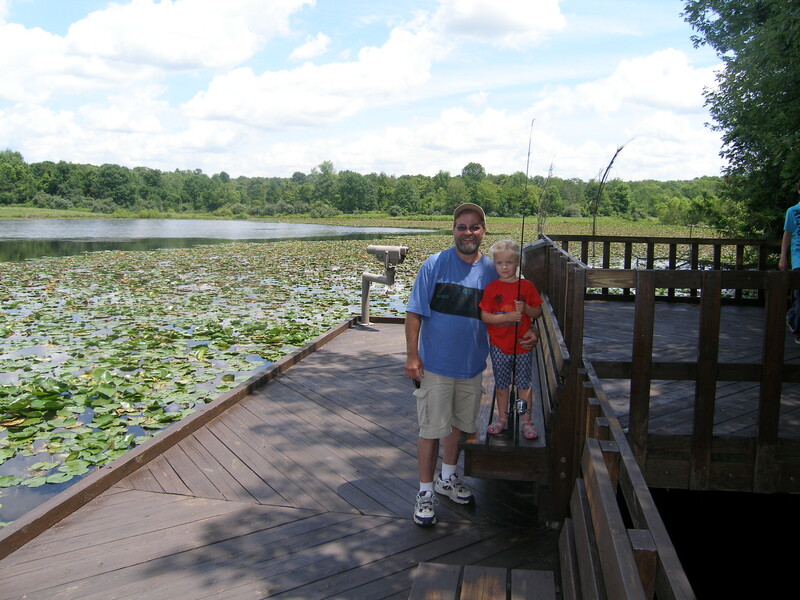 But, each year on Father’s Day, we go back to that same pond, and fish at that same dock. This year Elizabeth has been asking me for three weeks if it is Father’s Day yet. Elizabeth made a fishing pole for a Father’s Day gift this year too. The last few years have been harder than most years, for almost everyone. However, times will be good again in the future. We have all had bad times, and lost loved ones too soon. But, all of us also have at least one perfect moment, and if we were lucky we knew it was a perfect moment while we were living in it. When you are having a bad moment or a bad day, stop, just stop, and take a few seconds for yourself. Go back to your perfect moment, and relive your perfect moment. You deserve a little happiness; it will put a smile on your face, lighten your step, and make the rest of your day a lot better. I hope you have a great day today. Thank you.